Dual Pixel Auto Focus: screen shot from a Canon video. Canon introduced phase detection dual pixel auto focus (DPAF) in 2013, with the EOS 70D camera, calling the technology “revolutionary.” Since then, DPAF has been a feature on most new camera models released by Canon, from the $10,000 EOS C300 cinema camera, to the pro-level EOS 1DX MarkII, to Canon’s mirrorless EOS M6, to the consumer EOS Rebel T7i. DPAF is also showing up in smart phone cameras by Samsung and others, and several of the big camera companies have filed patents for similar types of sensors. But what is dual pixel auto focus? Is it really revolutionary? Does any other manufacturer offer a similar technology? What is Dual Pixel Auto Focus? On these new Canon CMOS imaging sensors, each pixel has two photo diodes which can operate separately or together. 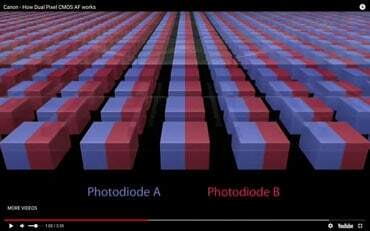 Each diode has a separate lens over it. When light goes through those lenses and hits the diodes, the processor analyzes each diode’s signal for focus and, once focus is achieved, the signals are then combined to record the image. Each pixel on the sensor, then, has a dual role. That dual role is what makes DPAF sensors different. In other kinds of imaging sensors, some of the pixels are used for focus and the rest record the image, but none does both. In Canon imaging sensors, 80% of the pixels (horizontally and vertically) play that dual role. The sensor on the EOS 5D Mark IV, for instance, is 6720 x 4480 pixels. At 80% coverage (5376 x 3584) more than 19 million pixels have DPAF. By comparison, the Sony a7R iii sensor is 7952 x 5304 pixels and has 399 phase detection auto focus points. While mirrorless cameras have been using phase detection auto focus in imaging sensors for some times, DSLRs typically use a separate phase detection auto focus sensor for focusing while the mirror is down and the viewfinder in use, and switch to contrast detection auto focus on the actual imaging sensor when the mirror is up and you’re using Live View or recording a video. And video is where DPAF can really shine, providing quick and accurate focus without the lens zooming in and out seeking focus. DPAF also makes following and keeping focus on moving subjects much easier and more accurate. And, you can easily manage focus and switch between subjects while shooting video using the touch screen in live view. For still photography, you can tap anywhere on the LCD screen on the back of the camera and get quick, accurate focus. 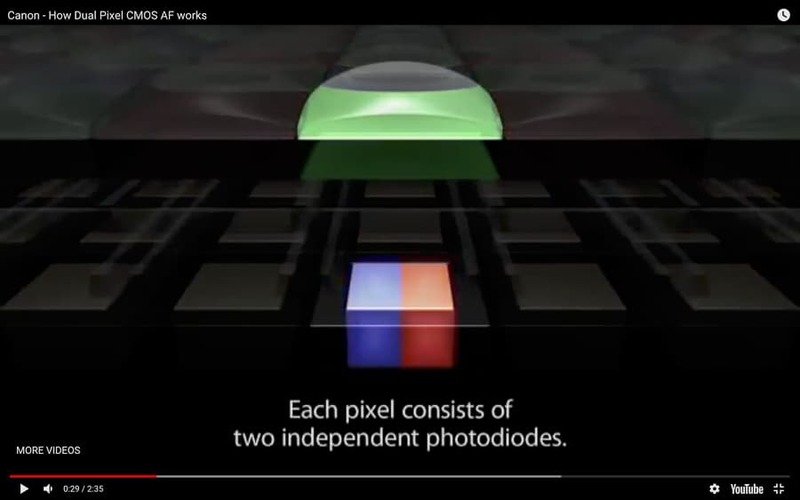 Dual Pixel Auto Focus: each pixel contains two photodiodes that operate independently. Screen grab from a Canon video. Samsung introduced DPAF in the Galaxy S7 and S7 Edge smart phones. DPAF sensors are also in the S8, S8+, S9 and S9+. Google’s Pixel 2 smart phones have DPAF sensors. The HTC U11 phone also has a DPAF sensor. A number of websites that follow the market report that Fuji, Nikon, Olympus, and Panasonic have filed patents for dual pixel autofocus (or very similar) systems. Is DPAF Really a Game Changer? 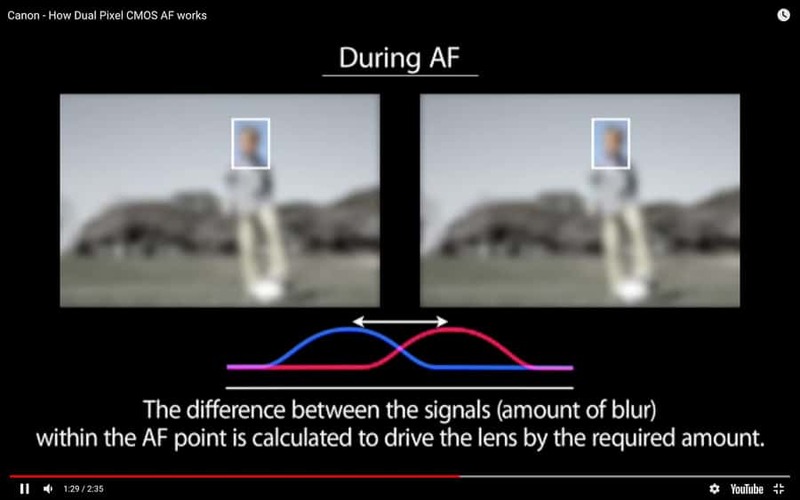 Before making a judgement about dual pixel auto focus, you have to understand how autofocus works and what DPAF does differently. In a DSLR, there are two sensors: a focusing sensor and an imaging sensor. When you’re using the viewfinder to compose your image, the mirror is down. That mirror reflects an image of the scene you’re about to shoot up into a pentaprism and into the viewfinder. A small translucent bit in the mirror also allows an image of the scene to be reflected down to the autofocus sensor (which is different from the imaging sensor that will capture the photo). If, on the other hand, you are composing using Live View, then the mirror is up, the focusing is done via the imaging sensor and the autofocus sensor is not used. Typically, the focusing sensor uses phase detection and the imaging sensor uses contrast detection to auto focus. Contrast detection looks at the micro contrast along edges. It can tell if the edge is sharp or not in focus, but it can’t tell if the lens is front focusing or back focusing. So, it instructs the lens to move forward and backwards to determine which way and how far to move to acquire focus. This process is slow, compared to phase detection auto focus. However, because it uses the actual sensor, you can be sure of getting accurate focus. How phase detection auto focus works. Screen grab from Canon video. Phase detection is noticeably faster than contrast detection auto focus, which is helpful when shooting sports, wildlife, weddings, etc. It matters less for still objects like landscapes. It matters more when shooting video, where you want focus to happen quickly and seamlessly. A DSLRs focusing sensor will have certain number of phase detection points for autofocus. The EOS 5D Mark IV has 61 auto focus points, for example. My Nikon D750 has 51. However, if I’m using Live View (with contrast detection on the imaging sensor), I’m not restricted to 51 points—I can place my focus anywhere on the Live View screen. Mirrorless cameras, by contrast, just have the one sensor that typically uses phase detection auto focus. Sony’s a7R iii has 399 focus points. The Olympus OM-D EM-1 MK II has 121 focus points. Each of these focus points represents a pixel that’s not recording image data. It is just being used for focus and the image data is interpolated from nearby pixels. While that can have a minor effect on image quality, it’s not enough to notice. What you get in focus speed and accuracy more than make up for any miniscule loss of image quality. Dual Pixel Auto Focus is certainly an interesting technology. With every pixel on the sensor capable of recording your image, the image quality could be marginally better but, with today’s sensors, you will probably never be able to tell the difference. For a landscape photographer, it’s not a compelling reason to get a new camera, though it might be nice to have. If you’re doing portraits or photographing events and weddings, you’ll probably be composing and focusing through the viewfinder and won’t really use DPAF. For videographers, though, this could be big! Most professional videographers have used manual focus to avoid having the lens hunt for focus. In Hollywood, for each scene the camera-to-subject distance is measured out and focus noted for anywhere the actors will be. As the scene unfolds, the camera operator manually moves the lens to those predetermined focus points. Videographers using a DSLR to record video often made sure the focus was right before recording each shot. By contrast, dual pixel auto focus can give you immediate, accurate focus without the lens hunting back and forth. You can tap the LCD screen and quickly and easily set the focus on a different subject. With phase detection DPAF, the camera will respond smoothly and almost instantaneously. The camera will be far less likely to lose focus when a person or object crosses between you and your subject or when there’s a bright light or a high contrast area in the scene. Canon also claims that the DPAF system is much faster and better at keeping moving objects in focus. People who are currently using mirrorless cameras for stills or videos probably won’t find DPAF a compelling reason for buying a new camera or system. Many of the mirrorless brands shoot video in 4K, but not all Canon DSLRs do. And Sony’s a7Riii’s 399 focus points seem plenty. In smart phone cameras, DPAF will have the same kinds of benefits as in DSLRs, particularly with video. In addition, DPAF can help simulate the bokeh you often can’t get with smart phone cameras. (Smart phone cameras’ depth of field is enormous due to their small image sensors and proximity to the lens.) Apple and other manufacturers have used dual cameras to achieve the same effects. As more people start using phones to record videos and as phones get more sophisticated and capable, this could be a good selling point. Dual Pixel Auto Focus provides enough of a benefit that most of the camera companies and phone makers are working on it. Patents have been filed and rumors abound about which cameras will get it and when. You’ll probably get it the next time you upgrade your gear. Would I sell everything to get a DPAF camera now? No. It’s a “nice to have,” not a “must have.” However, if I was doing a lot of video, I might be really tempted. Will it be in every camera in the next few years? Yes. And it that will be a good thing.